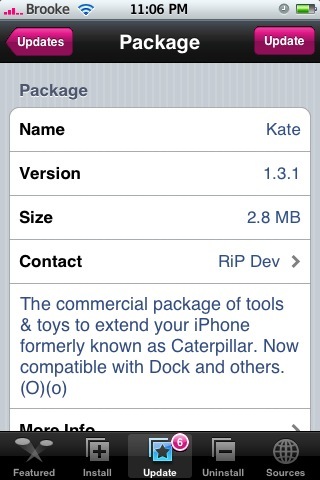 If you have been around the jailbreak scene for any length of time, you are probably familiar with the RipDev. They have brought us some amazing applications over the last two years including; Installer, Kate and Icy. According to a recent announcement on their website, they are saying goodbye to the iPhone community. The announcement makes me a little sad. Ripdev, and their applications, have been a huge part of the jailbreak community. Below is what they have to say. Even though the jailbreak for firmware 2.0 is now available, if you choose to upgrade and jailbreak…you will not see much. The only thing available in the jailbreak is Cydia with a few applications like OpenSSH. You will not even see Installer yet. Below is what the RiP Dev blog has to say about the progress of Installer 4.0. As you surely know by now, Pwnage Tool 2.0 is out. And for now, it has no Installer 4.0 in it. This is because we have decided to not release an undertested product into the wild – we don’t want any mess on the phone this time. So Installer 4.0 will come out soon… as soon as we’re confident it functions properly, we will release it – and trust us, we are not going to delay it for a long time.